You might not think much of late night junk food snacking, but the truth is that it could hurt your sleep, affect your weight, and even do harm to your mental health. When you eat junk food and you get a blood sugar rush, you might find it harder to fall asleep. Beyond that, what you eat could even have an impact on the types of dreams that you end up having while asleep. Eating foods that are spicy, and consuming dairy, late at night may result in dreams that are confusing. Plus, snacking late at night can cause gastrointestinal discomfort that ends up keeping you up. Therefore, if you want to rest assured that you will be able to enjoy good quality sleep, avoid snacking on junk food at night. Eating later in the evening and during the night increases the odds that you will gain weight. After all, you will be consuming a lot of fat and calories before hitting the sack, so you won’t be burning anything off. Beyond that, a study even found that late night snacking may boost your risk of developing heart disease and diabetes. That’s because snacking at night will increase insulin and glucose levels, as well as cholesterol. On the other hand, if you focus on eating during the day, the body produces a hormone that can help you feel fuller for a longer period of time. 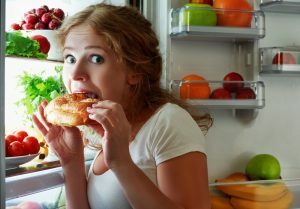 Finally, late night snacking on unhealthy foods can even adversely affect cognitive function and memory, according to The Telegraph. When researchers fed mice (who are nocturnal) during the day, they found that the animals with disrupted eating patterns weren’t able to recognize new objects as well as mice that ate when they were supposed to. On top of that, the animals’ long-term memory capabilities were also damaged. So, because you’re a human who’s been designed to eat during the day, it’s best to eat when the sun is out, rather than late at night, if you want to help keep your mind as sharp as possible. For these reasons, you should avoid late night junk food. Instead, focus on eating healthy foods throughout the rest of the day so that you can prevent cravings when you should be getting your body ready for a restful night of sleep. With the right strategy, you will be able to get your body on track and avoid late night junk food completely.